The Web Client Software Factory is a great software factory from Microsoft Patterns & Practices that enables you to pretty easily make well-constructed enterprise ASP.NET applications that can be extended by downstream developers. The factory contains a lot of stuff - recipes, templates, and a lot of help to automate some common tasks - but the key item you’ll find in there is the Composite Web Application Block. The CWAB allows you to make modular web applications that come together at runtime to make a nice, seamless experience. It makes it easy to partition work to various teams but maintain a consistent experience across the application. It also enforces some nice Model-View-Presenter separation of concerns when using web forms. Well worth the effort to use. You don’t want the stock guidance packages. That is, the recipes and templates and other automation items don’t do what you want them to or are otherwise just something you don’t want. Maybe it’d cost more to modify the guidance package to do what you want than it would be to just manually do the work. Maybe you don’t want the dependencies that the guidance packages assume you want. Whatever the case may be, you don’t want the guidance packages. You don’t want to deal with the developer environment cost. Having guidance packages that everyone has to use also means you have one more thing to install on every developer machine. When upgrades come around, it’s not just dropping an assembly in a folder to take the upgrade. There’s a cost associated with this, and you may not want to incur it. Either way, you may not want the whole thing. What do you get by not taking it all? Slightly ore complex setup.It’s a little more effort to manually get a CWAB project going if you don’t use the guidance packages. Not much worse, but this is a legitimate downside. Manual control over everything. File placement, assembly breakdown, naming, etc. You could customize the guidance packages to do things your way, but it’s not a 20-minute undertaking to do so. If you’re not going to be adding pages or projects every single day, it’s probably cheaper to just do it manually. Fewer implied dependencies. The guidance packages assume you want the Patterns and Practices logging, security, and exception handling application blocks, so there’s a lot of extra stuff that goes into the templates and such to support that. It can be a pain to rip all of this out if you don’t want it. The only extra dependencies you have when you’re using CWAB solo are CWAB proper and ObjectBuilder. Easier upgrades.When a new version of CWAB comes out, it’s an assembly update, not something that has to be installed on every dev box. Easier ability to implement standard forms authentication.Out of the box, CWAB uses the security application block for locking down page access. If you just want standard location-based authorization it’s easier to do it without the security application block in your way. Add references to the Microsoft.Practices.CompositeWeb.dll and Microsoft.Practices.ObjectBuilder.dll. Add a reference to Microsoft.Practices.CompositeWeb.dll and Microsoft.Practices.ObjectBuilder.dll. Add a reference from the web application to the module. Add a Global.asax that derives from Microsoft.Practices.CompositeWeb.WebApplication. Break the page up into Model-View-Presenter format with the presenter and view interface in your “Shell” module. Update the page namespace to match the namespace the presenter and view interface are in. Update the page to implement the view interface. Update the page to derive from Microsoft.Practices.CompositeWeb.Web.UI.Page. Add a Presenter property to the page with a [CreateNew] ObjectBuilder attribute on it. Add the page to the “Shell” module initializer’s site map registration. Rinse and repeat for additional pages - put the presenter and view interface in the proper “business module” and implement the interface on the page. There are a lot of things you can do to make this way, way easier. Create abstract generic “View” and “MasterPage” base classes. There’s a lot of common “template” sort of stuff (like the “Presenter” property on every single web page) that can be removed by creating some abstract generic classes and deriving from those instead. Create abstract module initializer classes for business modules and foundational modules. Every business/foundational module initializer is almost identical. You can make it easier to create initializers if you have some base classes that have abstract methods you’re forced to implement. To get standard location-based authorization working with the site map, you’ll also need to create a custom SiteMapProvider to use in place of the one that comes with Composite Web Application Block. The reason you’ll need that is because the out-of-the-box version trims by security application block settings. To bypass that and use standard location-based auth, you’ll need a custom provider. It sounds like a lot, but keep in mind it’s one-time work and once you’ve got it set up, it’s not all that bad. To get you started, I’ve got a sample project you can download and see it in action. You’ll need to get the Web Client Software Factory because you’ll need the assemblies that come with it (I didn’t include them in my sample project). Drop them into a specific folder in the sample project and you should be good to go. The “Framework” module has some example abstract base classes for views and initializers. The “Navigation” module has a service that helps you locate existing nodes in the site map and contribute to them - something the CWAB doesn’t come with out of the box. The “Core” module has a location-based authorization SiteMapProvider example. The sample master pages and style sheets are the ones that come with the WCSF default site template. The sample is exactly that - a sample. It’s not really tested (it works in the context of the sample, though) and I don’t offer you any guarantees that this will work for you and be totally bullet-proof. Your mileage may vary, no warranty expressed or implied, etc. In this Two Minute WF, I’m going to tell you about WorkflowInstance. In the example, I not only create an instance of my custom workflow type, but I also start it running. It’s a little more complex than just creating a new object, but it’s not that much worse. The WorkflowRuntime is responsible for instantiating workflows and starting them running. Since workflow instances run on a different thread than the main program, I’m using an AutoResetEvent to do thread synchronization - we don’t want to end the program or dispose of the WorkflowRuntime until the WorkflowInstance has had a chance to complete its run. 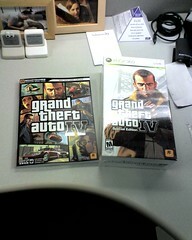 Picked up my copy of GTA4 just now. I’m off next week to play all week long and I totally can’t wait. Here are some photos of the unbox at my desk. 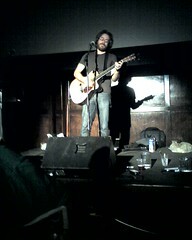 Jenn and I saw Jonathan Coulton with Paul and Storm last night at the Mission St. Theater in a sold out show. We got there about an hour before the doors opened and it’s good we did because the line was already pretty long. By the time the doors opened, it was around the corner and well down the block. As we were waiting in line, Jonathan, Paul, and Storm all walked past to get to the front door… and then walked right by again to head to the artist entrance. We got great seats right up front with no one blocking our view. Paul and Storm opened and we were very pleasantly surprised - I’d never heard them before, but they’ve made new fans of us. They played for about an hour and then there was a break before Jonathan Coulton came on. When he did come on, it was great. He really played the crowd well and the small venue added to it. He sang all of the great ones - Re: Your Brains, Still Alive, Code Monkey, Skullcrusher Mountain - and a bunch of others, also great. During Re: Your Brains, the audience sang the zombie part. Gotta love it. It was sort of a crazy crowd. Great people, everyone really wanted to be there, but… well, only at a Coulton show could I look down the line and see people reading the Learning Perl book. A wonderfully geeky mix of folks. I posted some pictures on Flickr of the show. They’re not the most exciting pix because the show wasn’t really flashy, but they’re decent and show you how close we were. I ended up getting the entire Thing a Week box set and the Smoking Monkey album. Support your favorite artists, right? Another cool surprise - the Thing a Week box set was signed and numbered inside. Awesome. We’ll definitely be going again when he comes back to town. The presentations from the InnoTech PDX conference I spoke at have been posted. You can get my “Unit Testing with Typemock” presentation as well as the demo code from there.